Mohandas Karamchand Gandhi was born in 1869 to a nondescript family in western India, but when he died in 1948 he was one of the greatest political leaders in human history. His influence and character were so strong that, by his mid-forties, he was already being referred to by the title “Mahatma,” meaning “great soul.” During his life, he was also referred with reverence as Ghandi-ji, or more commonly as Bapu, (“father”). Gandhi’s legacy is built on his commitment to nonviolent revolution—or satyagraha—through which he helped India obtain independence from the British Empire. His birthday is celebrated in India as Gandhi Jayanti, and worldwide as the International Day of Non-Violence. Origen of Alexandria (AD 185—254), also known as Origen Adamantius, was one of the earliest and most important Christian scholars. He is remembered both for prodigious scholarship and fanatical commitment to purity. He is credited with producing hundreds of works on theology, textual criticism, and biblical interpretation. Among Origen’s most important works are the Hexapla, De Principiis, and Contra Celsum. A few of his views were unorthodox, to the point that later generations debated whether he was a saint or a heretic. Origen studied under non-Christian philosophers in his birth city of Alexandria, Egypt, in order to better understand their arguments. This fueled one of his most important works, De Principiis (On First Principles). This is believed to be Christianity’s first comprehensive work of systematic theology. In it, Origen not only laid out a structured approach to Christian belief, but did so through (then) contemporary Greek philosophy. Another of Origen’s most important works is his Hexapla (Sixfold). This book is one of the earliest examples of textual criticism and scholarly apologetics, as well as a true interlinear Bible. The Hexapla is formatted in six columns: one column of Hebrew text in parallel with five columns of various Greek translations. Origen’s purpose in compiling this was to counter Gnostic and Jewish attacks on early Christianity. This work also provided Christians with a comprehensive guide to the Old Testament. The original is estimated to have been more than 6,500 pages long and took more than 28 years to complete. Origen also responded to an anti-Christian work, written shortly before his birth, by the Greek philosopher Celsus. Celsus’ work broadly attacked the history, philosophy, prophecies, and social duties of Christianity. In Contra Celsum (Against Celsus), Origen produced a detailed, powerfully intellectual defense of Christianity, one of the first and best of the early church era. In it, Origen answers Celsus point by point, weaving evidence, logic, and philosophy together in support of Christianity. Understanding Origen’s work can be challenging. He believed all Scripture had three levels of meaning: literal, figurative, and moral, and he often expounded various ways to interpret the same passage. Origen is a prime example of early church scholars accepting non-literal interpretations of certain passages, such as the creation account of Genesis. He was also a vocal critic of the view that only specially ordained men had the spiritual authority to interpret Scripture. Much of his work was a deliberate effort to promote knowledge over mere authority, including church leadership. Some of Origen’s ideas were unorthodox and put him at odds with fellow believers. For instance, Origen believed in the pre-existence of souls and that one’s status in the present world was proportional to one’s commitment to God during this pre-existence. His negative attitude toward the material world wasn’t much different than that of the Gnostics he so strongly opposed. He also considered the Trinity a ranking, not an equality, and believed that everyone, even demons, would one day be forgiven and purified by God. These claims were key to his being declared a heretic by various councils in the centuries after his death. Origen’s radical approach to purity of lifestyle was infamous. He lived in extreme asceticism, without shoes or a bed, and often worked instead of sleeping. He fasted twice a week and avoided all meat and wine. According to Roman historian Eusebius, Origen’s quest for purity led him, through an extremely literal interpretation of Matthew 19:12, to self-castration. Even among his admirers, this was seen as an extreme and unnecessary step, though later scholars would debate whether or not Origen actually performed the deed. Eventually, Origen’s uncompromising attitude toward Christianity and knowledge ran him afoul of the Roman Empire. Sometime after AD 251, a plague swept through Rome, and Emperor Decius laid blame on Christians for failing to worship him as a divine being. During the Decian persecution, Origen was imprisoned and brutally tortured but purposefully kept alive, in hopes he would recant his faith. True to his reputation, “Adamantius” remained a “man of steel” and was released from prison when Emperor Decius died. Unfortunately, Origen’s body hadn’t weathered the torture as well as his faith, and he died from his injuries very shortly after being freed. Origen devoted his life to making evidence, reason, and Scripture accessible to as many people as possible. His legacy is an excellent counter to any claim that early Christianity was shallow, superstitious, or anti-intellectual. Heretic or not, Origen is among the most important figures of the early church. Thomas Jefferson was inaugurated the third president of the United States on March 4, 1801, following one of the most bitterly contested presidential elections in American history. He had faced the unpopular incumbent, Federalist John Adams of Massachusetts—his confrere in the independence struggle and longtime rival. The electorate was deeply divided along regional, partisan, and ideological lines. Acrimonious campaign rhetoric punctuated the polarized political landscape. Jefferson’s Federalist foes did not invent the stinging accusation that he was an infidel. Years before, his ardent advocacy for disestablishment in Virginia had led many pious Americans to conclude that Jefferson was, if not an enemy of religion, at least indifferent towards organized religion’s vital role in civic life. The publication of his Notes on the State of Virginia in the mid-1780s exacerbated these fears. He wrote, “It does me no injury for my neighbor to say there are twenty gods, or no God. It neither picks my pocket nor breaks my leg.” This passage came back to haunt him in the 1800 campaign. Detractors said this proved he was an infidel or, worse, an atheist. Jefferson described himself as “a real Christian,” although he was certainly aware that his beliefs were unconventional. “I am of a sect by myself,” he said. He believed that human reason was the arbiter of religious truth and rejected key tenets of orthodox Christianity, including the Bible’s divine origins, the deity of Christ, original sin, and the miraculous accounts in Scripture. Republicans extolled Jefferson as a leader of uncommon liberality and tolerance—an enlightened man who zealously defended constitutional government, civil and religious liberty, and the separation between religion and politics. “[M]y information is that he is a sincere professor of Christianity—though not a noisy one,” Wortman wrote. The campaign rhetoric was so vitriolic that when news of Jefferson’s election swept across the country, housewives in Federalist New England were seen burying their family Bibles in their gardens or hiding them in wells because they expected the Scriptures to be confiscated and burned by the new administration. Although Jefferson’s beliefs drew the most attention, John Adams was not immune from political smears on account of religion. When President Adams recommended a national “day of solemn humiliation, fasting, and prayer” in March 1799, political adversaries depicted him as a tool of establishmentarians intent on legally uniting a specific church with the new federal government. This allegation alarmed religious dissenters, such as the Baptists, who feared persecution by a state church. “A general suspicion prevailed,” Adams recounted a decade later, “that the Presbyterian Church [which was presumed to be behind the national day of prayer] was ambitious and aimed at an establishment as a national church.” Although disclaiming any involvement in such a scheme, Adams ruefully reported that he “was represented as a Presbyterian and at the head of this political and ecclesiastical project. The secret whisper ran through all the sects, “Let us have Jefferson, Madison, Burr, anybody, whether they be philosophers, Deists, or even atheists, rather than a Presbyterian President.”” Adams thought the controversy, which drove dissenters into Jefferson’s camp, cost him the election. The bitterness lingered long after both men had left public office. In their declining years, they resumed a correspondence, slowly repairing their ruptured friendship. Jefferson’s wall, according to conventional wisdom, represents a universal principle on the constitutional relationship between religion and the state. To the contrary, this wall had less to do with the separation between religion and all civil government than with the separation between national and state governments on matters pertaining to religion. The “wall of separation” was a metaphoric construction of the First Amendment, which Jefferson time and again said imposed its restrictions on the national government only (see, for example, Jefferson’s 1798 draft of the Kentucky Resolutions). This landmark ruling laid the foundations for a long line of legal decisions restricting religion’s place in public life. The “wall” metaphor, in particular, provided the rationale for censoring religious expression in schools, stripping public spaces of religious symbols, and denying public benefits to faith communities. The bitterness of the election of 1800 has long faded from public memory. The partisanship and rancorous rhetoric that characterized the contest, however, have become familiar features of the political culture. An enduring legacy of the campaign is the perennial debate regarding the constitutional place of religion in civic life. Religion, argues one side, is an indispensable support for political prosperity, providing a vital moral compass in a regime of self-government. The other side, echoing Jeffersonian partisans, asserts that social cohesion and democratic values are threatened whenever bricks are removed from the wall of separation between religion and politics. This debate is as old as the Republic and as current as the morning newspaper. Martin Luther challenged centuries of vocational reflection. THE NOTION OF CALLING has always been at the very heart of Christian identity. For Jesus’ earliest followers, entering into Christian community meant sharing in a calling that stood in strong tension with other identities (see “Called first to Christ,” pp. 8–12). As Christianity spread throughout the Mediterranean world and became the faith of the empire, however, that tension began to ease. This might seem like a recipe for disaster—after all, if all Christians are “called” to abandon their nets to follow Christ, who will catch the fish? Milk the cows? Tend the crops? Build the roads? Change the diapers? Maintain justice? Medieval writers typically divided Christian society into three parts: the church, the political order, and the economy. Eleventh-century bishop Adalbero of Laon put it, “God’s house, which we think of as one, is thus divided into three: some pray, others fight, yet others work. . . . The services rendered by one are a precondition for the labors of the other two, and each in his turn takes it upon himself to relieve the whole.” But by the later Middle Ages, this arrangement was starting to show signs of strain (see “Duty and delight,” pp. 14–19). Luther (1483–1546) had tried life in the spiritual fast lane, and it had done him no good. 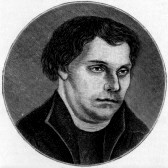 “Though I lived as a monk without reproach,” he recalled, “I felt that I was a sinner before God with an extremely disturbed conscience.” As he lectured on the Bible in his post as theology professor at the university in Wittenberg, Luther gradually came to develop a radically different understanding of Christian salvation. It did away entirely with “fast lanes” and “slow lanes,” as well as with the idea that vocation necessarily implies a call to abandon one’s nets and leave the world for the cloister. Luther’s revolutionary new theology of justification by faith alone was based on the insight that human life is lived out at the intersection between two basic relationships: a vertical relationship “before God” and a horizontal relationship “before humanity.” Before God, humans stand in a purely passive, helpless relationship. Luther argued that we, as finite beings, are utterly incapable of meriting our own salvation, or any good thing, for that matter. What makes the gospel “good news,” in Luther’s view, is that it reveals to us the righteousness God grants to sinners as a pure gift. This righteousness, Luther argued, is given to us freely through the Word of God. In contrast to human words, which merely name things—for example, when Adam gave names to the animals in the Garden of Eden—God’s Word is powerful. It called the universe into being from nothing, and it was the same creative Word calling faith into being when Christ spoke to his disciples from the seashore, or to his church through Scripture, sermon, or sacrament. This meant for Luther that vocation defined Christian identity. And “vocation” was not a special invitation to join God’s “fast lane” as a priest or a monk, but the transformative power of God’s Word uniting people to Christ in faith. I descend from heaven like the rain that makes the earth fertile. That is, I come forth into another kingdom, and I perform good works whenever the opportunity arises. If I am a minister of the Word, I preach, I comfort the saddened, I administer the sacraments. If I am a father, I rule my household and family, I train my children in piety and honesty. If I am a magistrate, I perform the office which I have received by divine command. If I am a servant, I faithfully tend to my master’s affairs. In short, whoever knows for sure that Christ is his righteousness not only cheerfully and gladly works in his calling but also submits himself for the sake of love to magistrates, also to their wicked laws, and to everything else in this present life—even, if need be, to burden and danger. For he knows that God wants this and that this obedience pleases him. Luther experienced these “discoveries” as “the very gate to paradise,” and he was confident that his gospel would liberate “those who work” and “those who fight” to rediscover the joy of their salvation. But Luther’s critics, then and now, pointed out that this understanding of vocation seemed to underwrite a deeply conservative view of the social order. And much confirmed this. Luther made clear that justification by faith alone dissolves the distinction between the “spiritual” and the “secular,” but he left wholly untouched any secular distinctions. How can you sin if you have faith and love? Since God is satisfied with your faith and your neighbor with your love, it is impossible that you should be called and still remain in a state of sin. . . . This call brings you from the state of sin to a state of virtue, making you unable to sin as long as you are in that state. All things are free to you with God through faith; but with men you are the servant of everyman through love. Luther was unwilling to use the gospel as a blueprint for reconstructing the social order. But he also insisted that a master who exercises his office sinfully, with no recognition that the gospel makes him “the servant of everyman,” fails to understand the gospel. Luther’s ambiguous legacy on these points echoed through the centuries, as Christians wrestled with the question of when their vocation as Christians calls them to support the social order and when it calls them to change it. But through those centuries, his message of God’s universal calling also comforted many in knowing they were doing the work of God’s kingdom as they caught the fish, milked the cows, tended the crops, built the roads, changed the diapers, and maintained justice. Any study of denominationalism or church history is sure to lead, sooner or later, to the terms High Church and Low Church. Originally, these terms defined movements within the Anglican Church, but the meanings have broadened to apply to non-Anglican churches, as well. The terms have to do with worship procedures, specifically, the use of ritual, liturgy, and accoutrements in worship. Leaders of a High Church congregation place a “high” emphasis on ceremony, vestments, and sacraments. Leaders of a Low Church congregation place a “low” emphasis on such things and follow a freer worship style. Anglican, Episcopal, Catholic, Orthodox, most Methodist and Lutheran, and some Presbyterian churches are considered High Church. Their worship services are characterized by liturgical readings and rituals, their clergy wear special clothing, and they follow a calendar of annual religious observances. Baptist, Independent, Pentecostal, Quaker, Amish, some Methodist and Lutheran, and many Presbyterian churches are considered Low Church. Their worship services are characterized by congregational involvement, a relatively unstructured program, and an evangelical approach. The distinction between High Church and Low Church did not appear until after the Reformation, of course. Then, the question arose: as the Protestant Church rejected Roman Catholic doctrine, how much Catholic procedure should be retained? Martin Luther and Ulrich Zwingli took opposing views. Luther considered that, as long as a rite was not specifically forbidden in the Bible, it was permissible for the church to practice. Zwingli’s view was that, if a rite was not specifically commanded in the New Testament, then it should not be practiced in the church. Luther’s position led to what is now known as High Church practice. Zwingli’s view, which led to the Low Church movement, is expressed in the Westminster Confession: “The acceptable way of worshipping the true God is instituted by himself, and so limited by his own revealed will, that he may not be worshipped according to the imaginations and devices of men, or the suggestions of Satan, under any visible representation or any other way not prescribed in the holy Scripture” (21.1). In other words, unless a practice is explicitly prescribed in Scripture, then the church should avoid it. John Wesley, an Anglican, was sometimes accused of being Low Church because of his open-air evangelism and his training of clergy outside of standard church channels. Wesley himself denied such charges, always emphasizing his commitment to the rituals of his church. To this day, the Wesleyan and Methodist traditions are an interesting mixture of High Church liturgy and Low Church evangelicalism. Low Church members often accuse the High Church of being “too Catholic.” High Church members sometimes look down their noses at the Low Church for being “unsophisticated.” Both sides should guard against spiritual pride (James 4:6). In truth, neither being High Church nor Low Church guarantees the proper worship of God. “God is spirit, and his worshipers must worship in the Spirit and in truth” (John 4:24). Sola scriptura emphasized the Bible alone as the source of authority for Christians. By saying, “Scripture alone,” the Reformers rejected both the divine authority of the Roman Catholic Pope and confidence in sacred tradition. Only the Bible was “inspired by God” (2 Peter 1:20-21) and “God-breathed” (2 Timothy 3:16-17). Anything taught by the Pope or in tradition that contradicted the Bible was to be rejected. Sola scriptura also fueled the translation of the Bible into German, French, English, and other languages, and prompted Bible teaching in the common languages of the day, rather than in Latin. Sola fide emphasized salvation as a free gift. The Roman Catholic Church of the time emphasized the use of indulgences (donating money) to buy status with God. Good works, including baptism, were seen as required for salvation. Sola fide stated that salvation is a free gift to all who accept it by faith (John 3:16). Salvation is not based on human effort or good deeds (Ephesians 2:9). Solo Christo (sometimes listed as Solus Christus, “through Christ alone”) emphasized the role of Jesus in salvation. The Roman Catholic tradition had placed church leaders such as priests in the role of intercessor between the laity and God. Reformers emphasized Jesus’ role as our “high priest” who intercedes on our behalf before the Father. Hebrews 4:15 teaches, “For we do not have a high priest who is unable to sympathize with our weaknesses, but one who in every respect has been tempted as we are, yet without sin.” Jesus is the One who offers access to God, not a human spiritual leader. First Baptist, Second Baptist, American Baptist, Southern Baptist, General Baptist, Independent Baptist, Primitive Baptist – the list goes on and on. Just who are these groups, and where did they all come from? Do they believe the same things or get along with each other? Depending on whom you ask, the Baptist church can be the oldest of all traditions, or a newcomer hanging on the coattails of the Reformation. It can be the standard-bearer of old-time, orthodox doctrine or the breeding ground of heresy. The truth is that the answer depends on whether you are examining a particular group or the fundamental doctrines of that group. Each Baptist group can trace its history to a particular starting point as an organization, but the roots go back to the very beginning of the Christian faith. Tracking down the origins of the Baptist Church in general is an exercise in ancient church history. From the days of the apostles, there was one Church of Jesus Christ, with a single body of doctrine taught by the apostles. The various local churches preached repentance and confession of sins, along with baptism by immersion as an outward sign of the new life in Christ (Romans 6:3-4). Under the authority of the apostles themselves as to doctrine, each church was independently governed by the leaders God placed in them. There was neither denominational hierarchy, nor distinction of “us/them” within the various churches. In fact, Paul soundly rebuked the Corinthians for such divisions (1 Corinthians 3:1-9). When disputes over sound doctrine arose, the apostles declared God’s teaching based on the words of the Lord and the Old Testament Scriptures. For at least 100 years, this model remained the standard for all churches. Thus, the characteristics that defined the earliest churches are the same that most Baptist churches identify with today. Starting around A.D. 250, with the intense persecutions under Emperor Decius, a gradual change began to take place as the bishops (pastors) of certain notable churches assumed a hierarchical authority over the churches in their regions (e.g., the church of Rome). While many churches surrendered themselves to this new structure, there was a substantial number of dissenting churches who refused to come under the growing authority of the bishops. These dissenting churches were first called “Puritans” and are known to have had an influence as far as France in the 3rd century. As the organized church gradually adopted new practices and doctrines, the dissenting churches maintained their historical positions. The consistent testimony of the church for its first 400 years was to administer baptism to only those who first made a profession of faith in Christ. Starting in A.D. 401, with the fifth Council of Carthage, the churches under the rule of Rome began teaching and practicing infant baptism. As a result, the separatist churches began re-baptizing those who made professions of faith after having been baptized in the official church. At this time, the Roman Empire encouraged their bishops to actively oppose the dissenting churches, and even passed laws condemning them to death. The re-baptizers became known as Anabaptists, though the churches in various regions of the empire were also known by other names, such as Novatianists, Donatists, Albigenses, and Waldenses. These Anabaptist congregations grew and prospered throughout the Holy Roman Empire, even though they were almost universally persecuted by the Catholic Church. By the Reformation, Martin Luther’s assistants complained that the Baptists in Bohemia and Moravia were so prevalent, they were like weeds. When John Calvin’s teachings became commonly known, many of the Waldenses united with the reformed church. Menno Simons, the founder of the Mennonites, organized the scattered community of Dutch Baptist churches in 1536. From this point on, the various Anabaptist churches gradually lost their ancient names and assumed the name “Baptist,” though they retained their historic independence and self-rule. The first English Baptist church was founded in 1612 by Thomas Helwys and John Murton, who had come under the influence of the Dutch Puritans in Amsterdam. This group became known as General Baptists, for their Arminian belief in general atonement. Another English Baptist church was formed after a schism from Henry Jacob’s congregation in London in 1633. This group held a Calvinistic theology of particular atonement and became the main influence in the English Particular Baptist movement. The first Baptist church in America was founded by Roger Williams in 1639. During the colonial and federal periods, the Baptist churches prospered and spread, while being only loosely organized as a fellowship. The first clear national organization was the General Missionary Convention of the Baptist Denomination in 1814. This was called by Luther Rice to address the need of raising funds and workers to carry out the missionary mandate in foreign countries. Some Baptist churches resisted this missionary emphasis and became known as Primitive Baptists. When the Civil War broke out, the Baptists in the North and the South broke their fellowship and formed separate denominations. Today, there are at least 65 different Baptist associations or denominations in the United States. Some retain a strict autonomy for the local church, while others have more of a denominational structure. Some have very conservative views of doctrine and practice, while others are quite progressive and liberal. Even within some groups there is a wide divergence of practice, so it is hard to pin down exactly what they believe. The Southern Baptist Convention (SBC) is a denomination comprised of over 16 million members in over 42,000 churches in the United States. Individual church membership is typically a matter of accepting Jesus Christ as personal Savior and submitting to believer’s baptism by immersion. The SBC is considered to be an evangelistic, mission-minded church with a generally conservative doctrine which focuses on the fact that Jesus died for our sin, was buried, and then rose from the grave and ascended to heaven. Unlike some other denominations, the churches in the SBC generally identify themselves as independent, autonomous congregations which have voluntarily joined together for mutual support. The American Baptist Church, USA, has roughly 1.3 million members and was formerly known as the Northern Baptist Convention, which formed after the split with the Southern Baptists. A key distinctive of the American Baptists is the freedom of the individual churches to have differing beliefs. The denomination’s unity is based on functional cooperation rather than doctrinal agreement. This practice led to a split in 1932, which resulted in the formation of the General Association of Regular Baptist Churches (GARBC). The GARBC holds a conservative doctrine and emphasizes evangelism and missionary work. The name “Baptist” has come to mean many things to many people, and so can sometimes cause confusion. As with any other church, the name above the door isn’t as important as what is taught within. As we examine any church, we would do well to follow the example of the Berean believers in Acts 17:11, who “searched the scriptures daily, whether those things were so” (KJV). The name “Presbyterian” applies to a diverse group of churches that adhere in some degree to the teachings of John Calvin and John Knox and are led by representative elders (presbyters) of their congregations. Within the broad category, there are some which can be considered conservative or fundamental, and some which would be called liberal or progressive. On the conservative side is the Presbyterian Church of America (PCA), with about 335,000 members in 1,700 congregations, while the Presbyterian Church, USA (PCUSA), with 2.3 million members in 10,000 congregations, is more liberal. Several smaller groups have formed over the years and cover the spectrum of beliefs and practices. The Presbyterian Church was first organized in Scotland under the leadership of John Knox. The Church of Scotland was affiliated with the Roman Catholic Church, even though it maintained an attitude of independence. John Knox was a priest in the Church of Scotland and was fed up with the abuses he saw in the Catholic leadership. He was exiled to England after his involvement in the murder of Cardinal Beaton in 1546. While in England, he was licensed to preach in the Church of England and was instrumental in reforming the Book of Common Prayer. When Mary Tudor ascended the English throne and started her bloody persecutions of the Church of England, Knox fled to Europe, where he met John Calvin and began to study Reformed theology. In 1559, Knox returned to Scotland and became a vocal proponent of Reformed theology and the concept of presbyterian leadership in the church. A number of Scottish lords had already been promoting religious reformation, and they gladly supported John Knox’s teaching. Under Knox’s leadership, these “Lords of the Congregation” wrote the Scottish Confession of Faith in 1560, which ended papal rule in Scotland and outlawed the Mass. The Scottish Confession remained the primary doctrinal guide for the Church of Scotland until the Westminster Confession in 1647. In the early 1600s, King James I sent many Scotch Presbyterians to Northern Ireland in an effort to displace the Irish and establish British control there. By the early 1700s, these Scotsmen were ready to migrate to America because of the economic trials they faced in Ireland. The first Presbytery in America was formed in 1706 in Philadelphia, and Presbyterianism spread rapidly in the colonies. One distinctive of the Presbyterian Church has been their emphasis on the education of their ministers. In the colonial period, the Presbyterian Church required advanced theological training for its ministers, whereas the Methodists and Baptists often allowed untrained men who were zealous for the gospel to carry on ministry. The result was fewer Presbyterian frontier preachers, but more theologians and seminary teachers. Even today, more theologians come from Presbyterian or Reformed backgrounds than from other groups, and Presbyterian theologians have made significant contributions to theological issues. Throughout the history of the Presbyterian Church, there have been splits and mergers based on theological and practical issues. In the colonial period, there was an “old side/new side” split over the acceptance of the revivalist preachers in the Great Awakening. In 1810, the Cumberland Presbyterian Church, which supported revivalist preachers, split from the main church. From 1837 to 1869, there was a split between “old school” and “new school” churches, with the “new school” teaching a modified understanding of sin and holiness. When the two groups merged again in 1869, it was with an increased tolerance for doctrinal diversity, which led to greater changes in the early 20th century. Until the 1930s, Presbyterians held a leading role in the various debates over doctrinal integrity. Some of the key men in supporting the Bible Conference movement were C.I. Scofield (1843-1921), James Brookes (1830-1897), William Erdman (1834-1923), Billy Sunday (1863-1935), William Biederwolf (1867-1939), and J. Wilbur Chapman (1859-1918). With doctrinal liberalism creeping into their seminaries, Presbyterians such as Louis Talbot (1889-1976), Lewis Sperry Chafer (1871-1952), and William Anderson (1889-1935) helped start new Bible colleges. As men like these saw the Presbyterian Church continue to tolerate doctrinal diversity, they led their churches to form new groups. In 1936, the Orthodox Presbyterian Church was formed. In 1938, the Bible Presbyterian Church was organized. In 1973, the Presbyterian Church of America came about. In 1981, the Evangelical Presbyterian Church was formed.